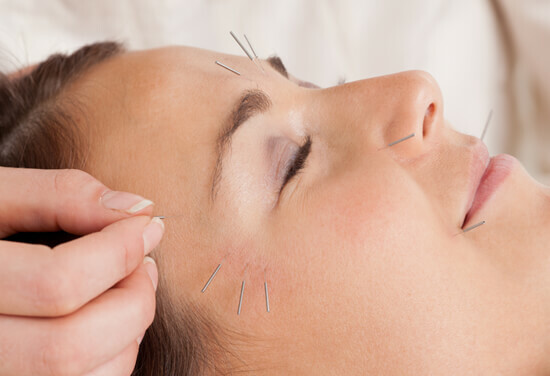 Cosmetic acupuncture, also called facial enhancement acupuncture, is an effective treatment used to rejuvenate the skin and minimise the signs of aging. It is natural, safe, non-invasive, and it works to enhance the appears of skin without the use of toxic substances, harsh abrasives or burning the skin. Everyone receives personalised treatment for their specific concerns, age, and health. Results are best gained when done as a series generally consisting of 8 -15 treatments. The benefits of cosmetic acupuncture are cumulative. You will continue to see the results in years to come. This is particularly true when supported by your ongoing self-care. Therefore, individual plans for skin care, general health, and nutrition are included to help you maintain a radiant glow, healthy aging for skin, body, and spirit. Cosmetic acupuncture can be started at any age, and unlike more invasive treatment can be undertaken as soon as you notice visible signs of aging. The ongoing benefits of cosmetic acupuncture will be obvious for years to come, increased collagen and elastin now will slow your skin aging for the future. Habitual facial expressions such a frowning and squinting can create deep wrinkles over time. As we age, our blood vessels also become less efficient and there may be less oxygen and nutrition supplied to the skin. Collagen and elastin become scarcer and the skin can sag and be more prone to wrinkles. Cosmetic acupuncture enhances circulation in the skin to increase the levels of oxygen and nutrients supplied to the cells, and increases collagen levels by about 1000 times! This helps your skin look and feel younger, it reduces the appearance of pores, improves muscle tone and can even skin tone for healthier and more radiant skin. Results and improvements can be seen within two weeks and will generally continue to improve for the duration of the course of treatment, which is usually 8 to 10 weeks depending on your personalised plan. While there are no significant side effects to cosmetic acupuncture, occasionally minor bruising can occur. This bruising can be treated with arnica, and generally, subsides within 24 hours. It is also possible to have some redness immediately after a treatment which generally fades within a few hours. The process of cosmetic acupuncture will significantly increase the absorption of products via the skin. This increases the effectiveness of anti-aging skin care products. However, care must be taken to ensure you are not using any toxic ingredients that will penetrate. Appropriate skin care will be discussed as part of your individual treatment plan. During treatments, I will only use products that are very safe and contain natural ingredients, oils, essential oils, and herbs. As with any acupuncture, the first step is to take a full health history so that treatments and products can be individualized for you. The treatment itself begins with some warm, moist towels placed on the face to soften and prepare the skin, then the face is massaged and cleansed. An herbal mask is then applied to the skin. Once cleansed, acupuncture needles are inserted to points on the body and the face, depending on the client’s needs, requests and concerns. Once the needles are removed, dermal rolling is applied to the desired area (usually face, neck and décolletage, and can include hands, C-section scars or stretch marks). Finally, a jade roller is used to cool and soothe, and recovery serum is applied to help with skin redness, healing, and collagen production. A treatment takes about 90 minutes. It's a relaxing facial and acupuncture rolled into one treatment!